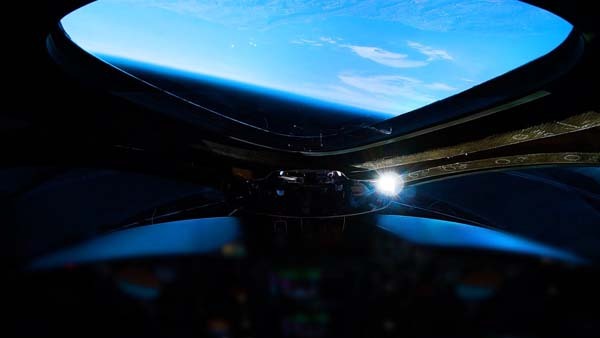 COLORADO SPRINGS, Colo., April 9, 2019 (Virgin Galactic PR) — The three-person crew from Virgin Galactic’s second space flight have received Commercial Astronaut Wings from the Federal Aviation Administration (FAA). Chief Pilot, Dave Mackay, Lead Pilot trainer, Mike ‘Sooch’ Masucci and Chief Astronaut Instructor, Beth Moses, were presented their wings at the 35th Space Symposium, where it was also announced that Virgin Galactic and The Spaceship Company (TSC) are to be presented the Space Achievement award later this week. 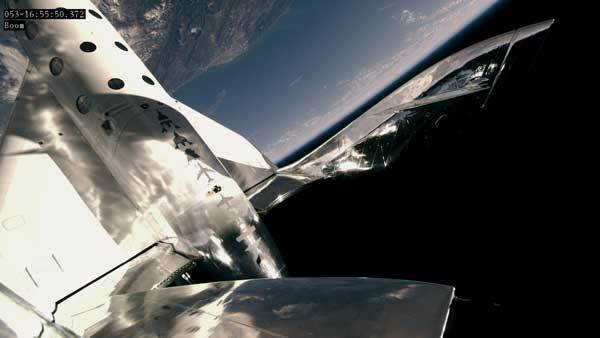 The United Arab Emirates (UAE) is looking to host flights of Virgin Galactic’s SpaceShipTwo, The National reports. Mohammad Al Ahbabi, director of the UAE Space Agency, said the organisation is working with Virgin Galactic on a bid to operate tourist space flights from Al Ain International Airport in the coming years…. Airbus has used Al Ain airport to stress test its new aircraft in high summer temperatures, including the wide-body A350. It was chosen for its hot, dry conditions and relatively quiet runways. Abu Dhabi is part-owner of Virgin Galactic having invested $390 million in the company through its sovereign wealth fund, Mubadala Investment Company (formerly known as aabar Investments). 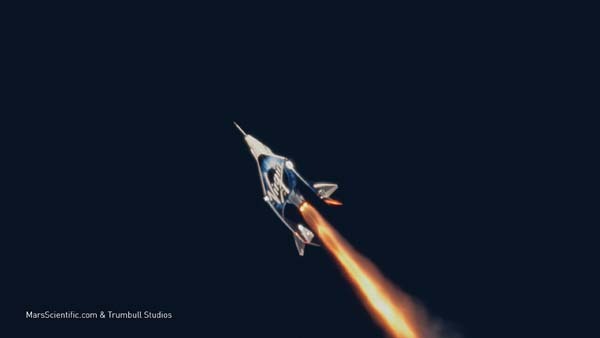 On Friday, Virgin Galactic’s VSS Unity flew to 89.9 km (55.87 miles) on its fifth flight test, which was the highest altitude the program has reached to date. There are two competing definitions of where space begins. The Federal Aviation Administration (FAA) is awarding civilian astronaut wings to anyone who flies above 50 miles (80.4 km). The Fédération Aéronautique Internationale (FAI) recognizes 100 km (62.1 miles) as the boundary of space, although it is considering lowering the limit to 80 km (49.7 miles). The FAA awarded astronaut wings to Mark “Forger” Stucky and Frederick “C.J.” Sturckow, who flew VSS Unity above 50 miles in December. The crew of Friday’s flight — pilots David Mackay and Mike ‘Sooch’ Masucci, and chief astronaut instructor Beth Moses — will also qualify for astronaut wings. 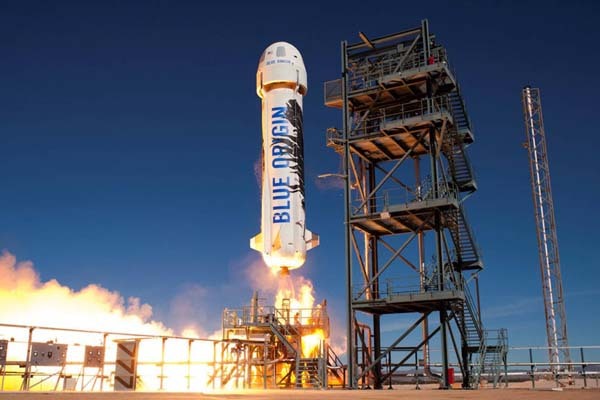 New Shepard has flown 10 times without passengers; nine of those flights were above 100 km (62.1 miles). Bezos has said he expects to begin flying people aboard the suborbital spacecraft by the end of this year. MOJAVE, Calif., 22 Feb 2018 (Virgin Galactic PR) — Today, Virgin Galactic conducted its fifth powered test flight and second space flight of its commercial SpaceShipTwo, VSS Unity. 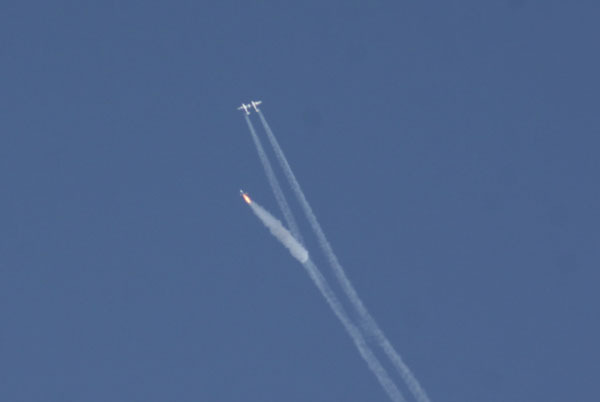 In its fifth supersonic rocket powered test flight, Virgin Galactic reached space for the second time today in the skies above Mojave CA. Spaceship VSS Unity reached its highest speed and altitude to date and, for the first time, carried a third crew member on board along with research payloads from the NASA Flight Opportunities program. Virgin Galactic’s SpaceShipTwo Unity completed its fifth powered flight on Friday, setting new altitude and speed records while carrying a third crew member for the first time. 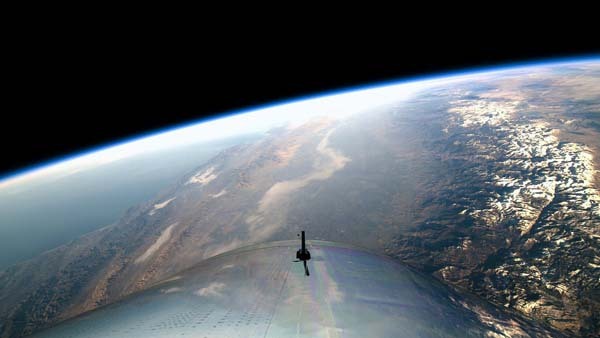 Richard Branson’s suborbital space plane hit Mach 3.04 as it soared to an altitude of 295,007 ft (89.9 km/55.87 miles) over the California’s Mojave Desert. Unity’s previous flight reached Mach 2.9 and an altitude of 82.72 km above the High Desert. Virgin Galactic Chief Pilot David Mackay was in command with Mike ‘Sooch’ Masucci in the co-pilot’s seat. The company chief astronaut trainer, Beth Moses, was aboard to test out the astronaut experience. She was able to leave her seat in the six-passenger cabin and float around. The vehicle took off from Mojave about 25 minutes ago (about 8:05). David Mackay and Mike ‘Sooch’ Masucci are in t6he pilot’s seat. Beth Moses, who is 5the chief astronaut trainer, is aboard to evaluate pilot experience. They are expecting to drop SpaceShipTwo from WhiteKnightTwo at about 8:55 a.m. PST. 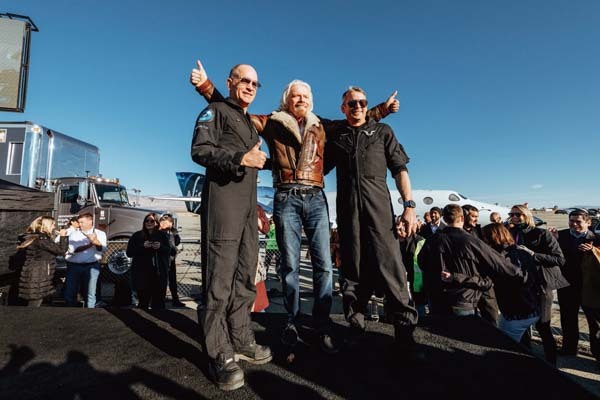 MOJAVE, Calif., February 19, 2019 (Virgin Galactic PR) — Virgin Galactic’s historic, first spaceflight, was a wonderful way for our dedicated and talented teams to close 2018. 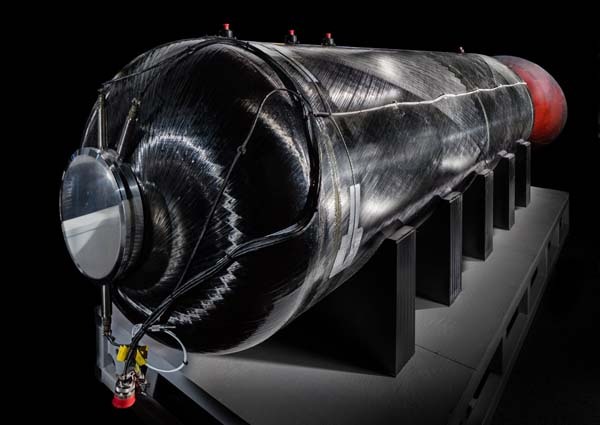 But now, with the rocket motor from that flight on show at the Smithsonian National Air and Space Museum and our first space pilots proudly wearing their FAA Commercial Astronaut Wings, we are getting ready to return VSS Unity to the black skies. aviation and space achievements will compete for the 2018 Robert J. Collier Trophy. For 107 years, the Collier Trophy has been the benchmark of aerospace achievement. Awarded annually “… for the greatest achievement in aeronautics or astronautics in America,” it has been bestowed upon some of the most important projects, programs, individuals, and accomplishments in history. Virgin Galactic pilots Mark “Forger” Stucky and Frederick “C.J.” Sturckow, who were awarded civilian astronaut wings last week, are among 18 pilots who have flown suborbital flights. The two pilots flew SpaceShipTwo Unity to an altitude of 51.4 miles (82.72 km) on Dec. 13, 2018. That accomplishment qualified them for civilian astronaut wings using an American definition that places the boundary of space at 50 miles (80.46 km). Virgin Galactic Founder Richard Branson says he wants to fly to space aboard SpaceShipTwo as America celebrates the 50th anniversary of the Apollo 11 moon landing on July 20, Agence France Presse (AFP) reports. “My wish is to go up on the 50th anniversary of the moon landing, that’s what we’re working on,” the head of the Virgin group said on the sidelines of an event to honor Virgin Galactic at the Air and Space Museum in Washington. Whether a SpaceShipTwo flight on the anniversary of the moon landing will be seen as a fitting tribute to America’s greatest achievement in space or merely a giant PR distraction is uncertain. Whether they will be able to make that date is equally unclear. SpaceShipTwo Unity is still undergoing flight tests at the Mojave Air and Space Port in California. (Branson told AFP the next flight is set for Feb. 20, weather permitting.) And practically all of his previous predictions for the start of commercial flights have been proven wrong over the past 14.5 years. Branson plans to be on Virgin Galactic’s first commercial flight, which will take place from Spaceport America in New Mexico. His son, Sam, and other passengers are set to be aboard the flights. Perhaps he will take Apollo 11 moon walker Buzz Aldrin, who just turned 89, along with him. Branson told AFP that Virgin Galactic costs $35 million per month or $420 million per year to operate. He previously estimated he has spent $1 billion to $1.3 billion on the SpaceShipTwo program since it was announced in 2004. Virgin recently laid off about 40 employees from Virgin Galactic and its sister company, The Spaceship Company. The ceremony on Thursday where the two Virgin Galactic pilots who flew above 50 miles in December will be awarded commercial astronaut wings will be webcast on the FAA’s YouTube channel. The 30-minute ceremony will begin at 2:30 EST/11:30 PST.